Suitable for the Nintendo DS. The game allows the player to explore Peppa’s world and interact with all the fun things seen in the TV show and more. 10 re-playable games and fun activities are included, plus 1 bonus activity the dressing up game. The mini-games all have very simple mechanics and controls allowing the young audience to enjoy them both instinctively and immediately. Touch the bubbles that Daddy Pig blows to pop as many as you can. Steer George’s rocket on an adventure through space using the stylus. Peppa and George have been riding their bicycles in the mud and Mummy Pig is helping them to clean them. Use the sponge and hose to clean away the mud and touch the screen to pop soap bubbles as they appear. Peppa is helping to collect apples for Mummy Pig’s apple pie. George is helping too by collecting the rotten apples for the compost heap. Collect as many as you can and see how high you can throw the apples. To grow as many beautiful flowers as possible, water the seeds with the watering can and watch them grow. Use the stylus to throw bread into the pond and feed the ducks at the end of the garden. Stop George from scaring the ducks away by giving him some bread too. Peppa and George love to make pictures. Slide and drop different shapes to make a picture. Help Peppa and George decorate Mummy Pig’s cupcakes by sliding and dropping different sprinkles. Experiment with different designs and colours. Help Peppa and George to blow out Rebecca Rabbit’s birthday candles by touching the candle flames or blowing into the microphone. Daddy Pig has filled the house with balloons, Peppa and George have decided to play hide and seek underneath them. Touch the balloons to burst as many as you can to find Peppa and George. Peppa is playing a dressing up game but can’t decide what to wear. Help her choose the best outfit. You can save your favourite outfits in Peppa’s photo album so you can show your family and friends later. For ages 3 years and over; EAN/MPN/UPC/ISBN: 5060203320133. This toy costs approximately £9.99 (for the latest and best prices make sure you check our retailer list for the Pegga Pig 2 Fun And Games DS above). 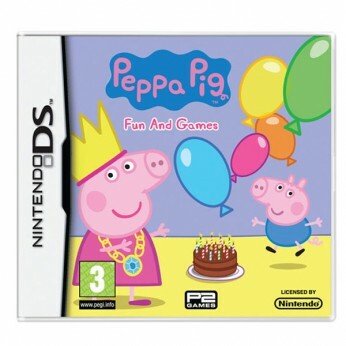 In our review of Pegga Pig 2 Fun And Games DS we classed it as being suitable for ages 4 years, 5 years, 6 years but recommend you check the manufacturer specific advice before purchasing.